Hammer (born 17 April 1948, in Prague, then Czechoslovakia, today the Czech Republic) is a composer, pianist and keyboardist. He is probably best known for playing keyboards with the Mahavishnu Orchestra in the early 70s, as well as his "Miami Vice Theme" and "Crockett's Theme", from the popular 1980s US television program, Miami Vice. Hammer has collaborated with some of the era's most influential jazz and rock musicians such as Jeff Beck, Al Di Meola, Mick Jagger, Carlos Santana, Stanley Clarke, Neal Schon, Steve Lukather, and Elvin Jones among many others. He has composed and produced at least 14 original motion picture soundtracks, the music for 90 episodes of Miami Vice and 20 episodes of the popular British television series Chancer. 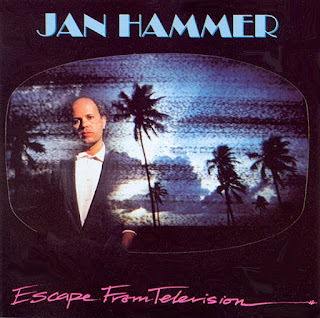 Jan Hammer's mother was a well-known Czech singer named Vlasta Průchová, and his father was a doctor who worked his way through school playing vibes and bass. Hammer began playing the piano at the age of four and his formal instruction started two years later. He aspired to follow his father into medicine until a family friend convinced him to develop his musical talents instead. Hammer formed a jazz trio in high school, performing and recording throughout Eastern Europe at the age of fourteen. Upon entrance to the Prague Academy of Musical Arts, he completed many compulsory classes including harmony, counterpoint, music history, and classical composition. When the Soviet Union invaded Czechoslovakia in 1968, Hammer's studies at the Academy were cut short, and he moved to the United States and resolved to become a citizen after receiving a scholarship at Berkley College of Music in Boston. Upon completion of his studies, Hammer spent a year touring with Sarah Vaughan, recorded with Elvin Jones and Jeremy Steig, then moved to Lower Manhattan and joined the original lineup of the Mahavishnu Orchestra with guitarist John McLaughlin, violinist Jerry Goodman, bassist Rick Laird, and drummer Billy Cobham in 1971. A successful jazz fusion band, they performed some 530 shows before their farewell concert on December 30, 1973. Hammer was one of the early pioneers who played the Mini Moog synthesizer in a touring group. The Jan Hammer Group was formed in 1976 and supported The First Seven Days on tour, receiving good reviews from both jazz and rock critics. The group turned out three LPs the following year: their own Oh, Yeah? and, with Jeff Beck, the RIAA platinum Wired (with Jan's "Blue Wind"), and Jeff Beck with the Jan Hammer Group Live, a chronicle of their 100-show tour together, certified gold. One final album by the group followed in 1977, Melodies. Hammer composed music for Czech fairy-tale Šíleně smutná princezna (The Incredibly Sad Princess). His greatest challenge came in the fall of 1984, when the producers of Miami Vice enlisted him to commence the rigorous weekly schedule of scoring the series. The popular success of his music on the series was evident after just one season when, on November 2, 1985, the Miami Vice Soundtrack hit number one on the Billboard Top Pop album charts. The album achieved quadruple-platinum status with U.S. sales of more than four million copies. At the Grammy awards in February 1986, "Miami Vice Theme" earned Hammer two awards; one for "Best Pop Instrumental Performance" and one for "Best Instrumental Composition". He also earned Emmy award nominations in 1985 and 1986, for "Outstanding Achievement in Musical Composition". At the end of 1986, Hammer won Keyboard Magazine's poll as "Best Studio Synthesist" for a second consecutive year. He had previously won the "Best Lead Synthesist" honor for seven years, at which time he was inducted into the Keyboard Hall of Fame.